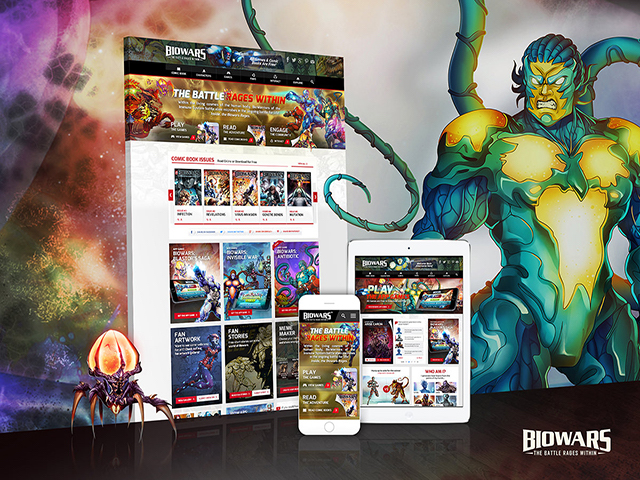 The Biowars mobile games and digital comics tell the story of the BioWarriors, cells of the human immune and nervous systems, given humanoid forms. New York-based digital agency Blue Fountain Media has announced the formal launch of its Biowars brand, including a new interactive website and two mobile games. Biowars: The Battle Rages Within was created by Gabriel Shaoolian, CEO and founder of Blue Fountain Media, who became interested in the inner workings of the human body during his time as a pre-med student at New York University. The Biowars franchise features the BioWarriors, cells of the human immune and nervous systems given humanoid forms, while retaining their real-life biological abilities. The main story of Biowars is told through a series of free digital comic books, which first debuted in November 2013, and grew to a user base of 126,000 Facebook fans through word-of-mouth. The main story of Biowars is split into two portions, with both focusing on the life of Alexander Hawking, a young man infected with a microbe designed to destroy the weakest members of the human race. One half of the series focuses on the battle within Hawking, as the BioWarriors work to destroy the disease, while the other half sees Hawking working to save the world itself from The Combine, the secret organization behind the microbe’s design and release. This is a project maybe 20 years in the making. I got the idea when I was in school … An idea occurred to me: why not take this incredible story that goes on in our bodies, about our immune systems and how they’re constantly defending us against these viruses and bacteria, and do it in a format that’d be entertaining, yet based on real-life science? With the exception of the writing for the comics, everything in the Biowars universe, from the development of the mobile games to the art within the comics, has been created in-house at Blue Fountain Media. One of the reasons we made [Biowars] was to set Blue Fountain Media apart as a digital agency … I don’t know of any other digital agency that has taken a concept, designed the characters, created the comic books, created the website, created the app games—soup to nuts—all in-house. This is a big case study for Blue Fountain Media. With the official launch of the brand, existing fans and newcomers alike have access to a redesigned website, and the first ten issues of the Biowars comic series. Shaoolian said his team plans to release a new issue in the series every two months, with the next coming in November. To encourage community interaction, fans can share their own artwork and stories based on the franchise, for the opportunity to be featured on the Biowars website (featured stories will receive cover art created by the Biowars team). Gamers can also create memes to share with their friends, or answer survey or poll questions about related topics (vaccinations, as an example). To give fans more even more opportunities to interact with these characters, two mobile games have been created for the series so far. The first is Biowars: Blastor’s Saga, a free-to-play level-based shooter on iOS and Android, which challenges players to defeat enemies by using one finger to move an aiming reticule around the screen, and another to shoot. In addition to shooting stages, the game offers platforming sections which resemble rhythm games, and challenge players to swipe as arrows reach a specific point on the screen. When players take damage in either kind of stage, they can call in a healing BioWarrior to heal them. The second mobile title is Biowars: Invisible War. Available on iOS and Android, as well as Facebook, the free-to-play, level-based side-scrolling shooter asks players to tap, or tap and hold, on the screen to make their main BioWarrior, as well as a partner character, move up and down in the environment. The BioWarriors fire their weapons automatically, leaving players to move the character to the appropriate height to hit or avoid stationary and moving enemies, as well as avoid damaging obstacles.